I've been hoping to share this DIY post for a while, but have been holding off because I haven't had the slightest clue what happened to my process photos. Those are, you know, usually helpful so you'd at least have a clue how we made this mirror! But alas, I've searched all of my devices and come up with nothing. So I'm sharing the final results with some instructions, and since you are all just so talented, I know you can figure it out! 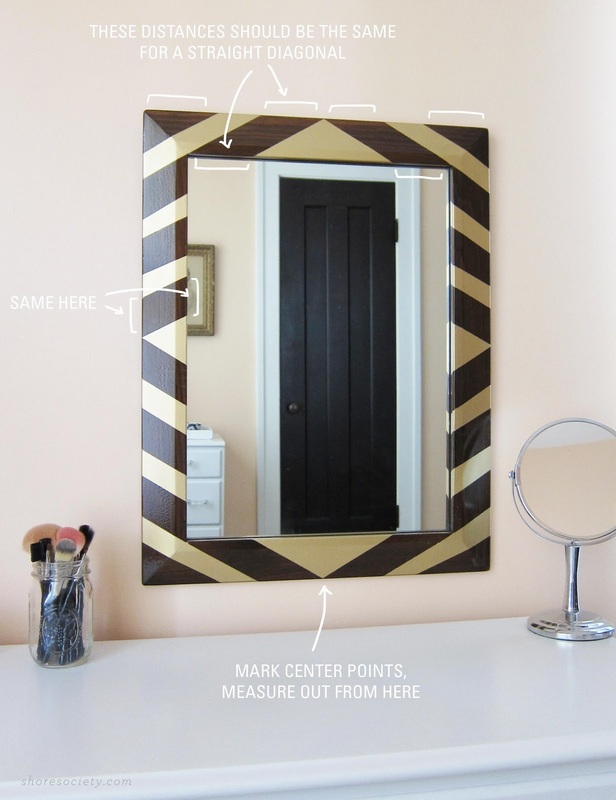 This is a great way to give a plain, old, or cheap mirror a new life. This mirror has somehow been dragged from place to place each time we moved, despite us never liking it/having a place for it. When I put together my vanity table, I thought it would be the perfect fit, but just needed a little glam-ifying :) It's perfect to share this week, too, since The Great Gatsby premieres tomorrow, and we'll all be having a love affair with Art Deco after that! 1) Gently run the sandpaper over the entire frame of the mirror, going with the grain of the wood. You're not trying to sand away imperfections, you just want to give a light buff to make it easier for the paint to stick. Wipe the dust off with a soft, dry cloth. 2) Put newspaper over the mirror area inside the frame, trying your best to tuck the newspaper under the wood frame to prevent any overspray from getting on the mirror. You don't need to tape it in place at this point. 4) Now, you'll tape off the areas where you want the wood to show through. Run the strips of tape around the inside lip of the frame and onto the newspaper (covering the mirror) to make a continuous line. Then, make sure your tape is sealed tightly to the surface of the wood by running your fingernail along the edge (key tip)! I left the areas around the center points untaped, to create a triangle shape. I think it adds that Art Deco touch, and makes the stripes look like they're radiating from those points. 5) Now, spray! You'll do two coats of gold, waiting a few hours between coats (or whatever is listed on the can). Let the gold paint dry overnight, then peel the tape off. Use a sharp x-acto blade to gently scrape any paint areas that might have snuck under the tape.You should hopefully be happy with the results, at this point, but it gets better! 6) Use the clear gloss lacquer over the entire frame (you'll need to re-set some newspaper back over the mirror), following the directions on the can. 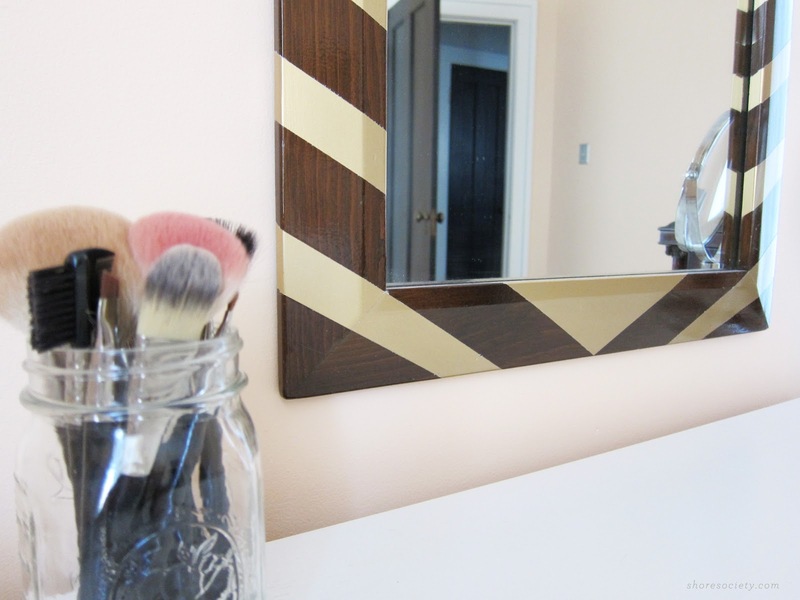 This not only sets the gold paint nicely, but gives the mirror a sealed, factory-like finish. Let it dry, then hang and enjoy! I'm really happy we were able to give this mirror a second chance, because it was headed for the donation pile. The clear lacquer even makes the wood look richer than before, so it's a major improvement. I'm definitely happy to see it every morning when I get ready. I think this would also be cool to do to a picture frame. That's why I love spray paint — you can use use it to transform just about anything. What have you guys been making over this spring? And who's going to see Gatsby? 1. I love this post. Like LOVE this post. 2. You are one of the most talented people ever. 3. I am going to see Gatsby and can't WAIT! It's my favorite book of all time. Girl, please!! ;) I haven't made movie plans yet, but I'm going to see it for sure! LOVE your interior door you can see in the mirror! Great DIY. Also can't wait to see Gatsby! Thanks! It's funny, when you photograph a mirror, you not only have to worry about keeping yourself out of the picture, but keeping the mess of the room out of it too ;) That's my closet door. I love the stain on it! 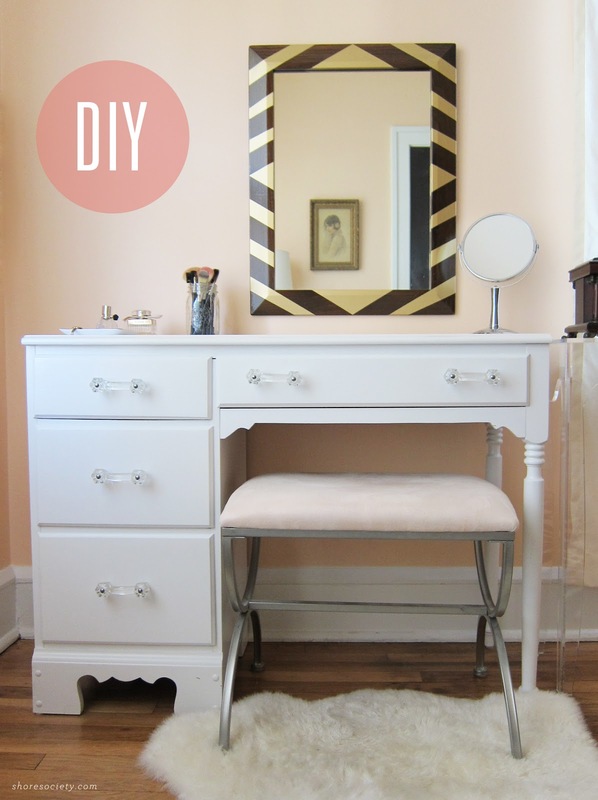 What great DIY, and your home looks beautiful. What a wonderful space. Ahhh so awesome-- reminds me of all the Great Gatsby hype! Thanks! Definitely dying to see the movie, too! Rachael, you are very creative! That mirror looks so nice. I wish I was as creative as you. I usually just buy my mirrors from World To Home website. I have a gold mirror at home that I got from that site. I get so many compliments from my visitors on how nice my mirror looks! Is your fur throw from Ikea? I love that throw...the whole look is so glamorous. Also, your mirror is fabulous. I immediately clicked because of the mirror and then saw the throw and, well, I love that room of yours. Thank you so much! Yes, it is from Ikea. It's great! Such an inexpensive way to glam up the room. Thanks for coming by!